Aforia circinata, photographed by Jan Delsing. Aforia is a genus of large conoid gastropods with a primarily bipolar distribution, being found in the North Pacific and circumpolar in the Southern Hemisphere (Powell 1966). Characters (from Powell 1966): Shell large to very large, up to 90 mm, thin, elongate-fusiform, with tall spire and long, slightly flexed and recurved unnotched anterior canal. 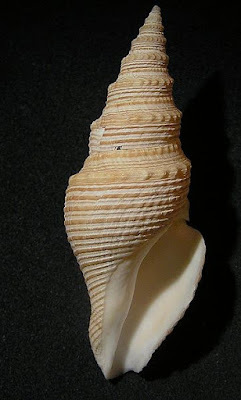 Protoconch slender, multispiral. Adult whorls conspicuously medially carinated, surface sculptured on lower half and whorls with numerous flat-topped spral cords, defined by incised lines; shoulder slope smooth except for incremental growth threads marking successive positions of sinus. Sinus deep, U-shaped, with rounded apex, occupying lower half of shoulder slope. Whole shell covered by thin shining buff-coloured periostracum. Operculum corneous, varying in form from roughly ovate to quadrate, nucleus terminal or subterminal, incurved in most instances. Radula consisting of large broad-based unicuspid central, no laterals, and pair of modified wishbone-type marginal, consisiting of massive simple pointed tooth with distal basal limb severed and superimposed.